You guysssssssss I totally failed you yesterday and didn't post anything here. I figured between MLK and Inauguration Day no one was going to come over to this neck of the Internet to see what kind of shenanigans I had gotten myself into over the weekend. If you really want to know I can recap it tomorrow, today is all about week 4 of the Biggest Loser. WARNING: I DO NOT SPOIL WHO WENT HOME LAST NIGHT, BUT I DO RECAP EVERYTHING ELSE. Did anyone else find themselves on a rollercoaster of emotions this week? All I did was cry!! This week the trainers left the ranch to spend time with the teens in their homes. -Bob and Bingo playing baseball. Bingo is going to be one hell of a pitcher someday! I loved seeing him light up on the diamond, seriously brought me to tears. -Dolvett and Lindsay cheerleading. This made me cry yet again. 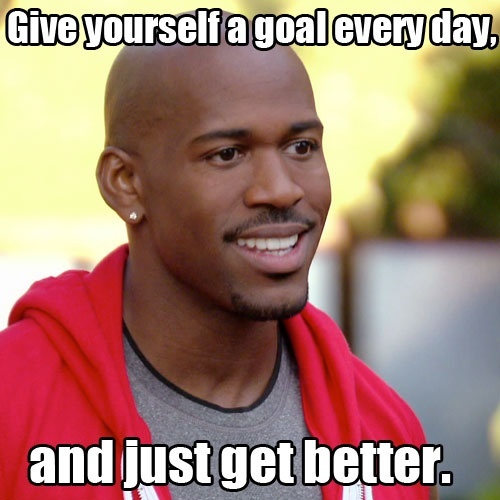 I just love how motivating and inspiring Dolvett is to not only his team but to Lindsay. Cheerleading is the sport she loves and wants to get back on the team and he put it right there in front of her to remind her that she WILL get there. 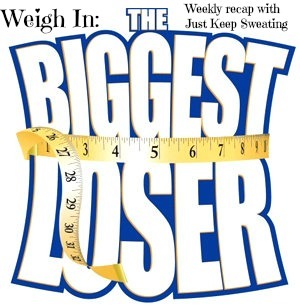 - The families are ALL making changes for a healthier lifestyle. This is so important for not only these kids on the show but all children. The challenge this week was running a 5k. This pushed every single competitor [except for Danni, IMO] outside of their comfort zone and everyone seemed to accept the challenge and tackle it head on. My girl Danni rocked that 5k and came in 1st! I cried along with her as she crossed that finish line. 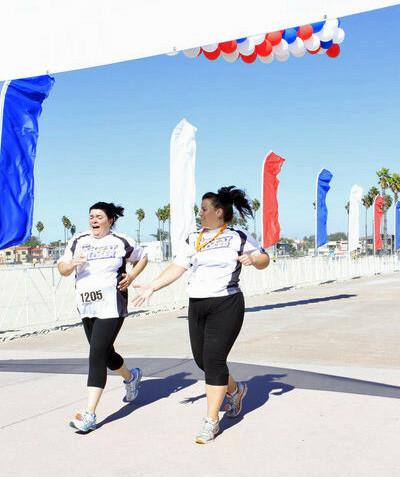 Then I cried again when she ran along side Pam as she crossed the finish line taking third. I told you I cried a lot during this episode! For the last chance workout, and only workout the teams had with the trainers all week, the white and blue team got their sweat on together. Jillian seemed to redirect her frustrations with Pam to Jeff this week and it was quite the battle. Again, I agree with Jillian...Jeff IS lazy and doesn't put the max effort into his workouts. However, he said he doesn't like Jillians negative approach and it causes him to not want to do the work. Eventually JM became so fed up with Jeff she threw him out of the gym and back to Bob. She said she didn't care anymore about his laziness and Bob called her on it, which I loved, because we all know when someone says they don't care about something it means they care 10x the amount that they show. On the flip side Jackson from the red team owned this week. He was the hardest worker and biggest motivator to his entire team, which honestly shocked me. I pinned him as lazy and full of excuses but it really was medical issues holding him back. This week he proved himself both inside and outside of the gym and I am now on team Jackson! Did you cry during last nights episode? What was your favorite moment[s]? How do you feel about who went home? I have to admit, it made me laugh that Jillian struggled a little with the rowing haha. But I still love her! I got emotional too when Danni went and ran the last few metres with Pam, and also when Sunni was talking to her mum. You can tell her parents love her so, so much. I always cry too. I love how close Bob and Jillian are. You can tell they are such good friends that Bob totally calls her on those things. "Quit saying you don't care Jill because we know you do that's why you came back". I think Jillian should be more aware sometimes though that her way of doing things may not work well with some people. I love Bob. That is all. Lol. 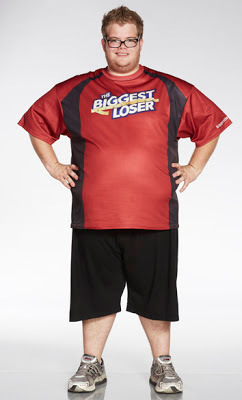 I freaking love Biggest Loser. There is so much awesomeness in this season. I love how they are connecting the kids' weight problems to the parents. I love how Biingo's mom is getting healthy too. I love how his dad accepted the blame for bringing the unhealthy stuff into the house. The contestants this time are bugging me. No one has a great 'story' to tell and they're so stinking whiny. It doesn't help that I also listen to Jillian's podcast and she's talking a lot about how difficult of a season it was.